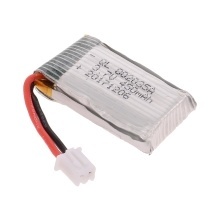 This 3.7V 450mAh Lipo battery is designed for Z51 RC Airplane Foam Hand Throwing Glider. Its high capacity offers higher power and longer run time for you. Do you want to experience more delight and joy with your RC drone, take it home. Made of high quality material, environmental protection. The 3.7V 450mAh lipo battery has enough capacity for you to use.